Seasons Greetings fellow Beaders! I know that December isn’t quite upon us yet but it’s just around the corner – can you believe it?! If you’re anything like me, you love the fact that your jewelry making skills can be easily put to good use during the entire holiday season – whether it’s making a piece of jewelry to perfectly coordinate with your party attire (or even to match your Thanksgiving apron – no judging! ), getting caught up on your craft show inventory, or for…GIFT-GIVING!! In all my years in the beading/jewelry industry, I’ve found that no time of year is busier for a beader than Fall heading into Winter. I, personally, love the gift-giving aspect of this passion of ours! Today I’m showing you a quick, easy, and inexpensive pair of earrings that are perfect for adding some sparkle to your lobes – or the lobes of others! These earrings are a proven smash hit at craft shows and anyone lucky enough to receive a pair from you will treasure them each season, for sure. May I present to you… THE MERRY MERRY EARRING!! (2 each) Swarovski Crystal Margarita Beads in 3 different graduated sizes. Here I’m using 6mm, 8mm, and 10mm in Crystal Vitrail Medium – which is the perfect color to represent a Christmas tree strung with colorful lights! Firstly, you’ll notice that the Crystal Vitrail Medium Margarita beads have a front and a back. In this, or any, project it’s up to you which side you would prefer to feature! Pictured here is the “finish” side face-up on the left and the “finish” side face-down on the right. You’ll want to make this distinction when you load your beads onto your head pin – or you can go a little wild and not worry about it at all! I’ve created my finished pair to have the finish-side facing down. Next, I’ve used my Chain Nose pliers and bent the head pin at a 90 degree angle right above the 3mm bicone. The great thing about using a 1″ head pin in this project is that you won’t need to snip the wire down at all – what’s left will be perfect for rolling your loop! ***TIP: Grab the head pin RIGHT above the 3mm bicone (so close that the pliers are touching it) and then move the pliers up just a hair… this small allowance of wiggle room is what will create your bend perfectly above your bead but won’t allow the pliers to be so close that they will crack the top. Use your Round Nose pliers to roll that left over wire above your bead into a nice clean loop. If you’ve never rolled a loop before, it can sometimes take practice to get the tip of the wire to meet perfectly atop the bead, so you may want to practice a few times first to figure out where on your pliers you need to grip the wire to create the perfect sized loop – as jaw size can vary plier to plier. Now, use your Chain Nose pliers to gently swivel open the loop of your ear wires. Then, simply slide your earring onto it and swivel it closed! Repeat the above steps for the other side and you’ll find yourself with a stunning pair of Merry Merry Earrings for yourself, to sell, or to gift to a co-worker or loved one! Previous Post Leah’s Holiday Season Palettes! 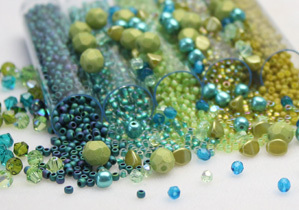 Next Post DECEMBER BEAD CHALLENGE! Can I get the beads here for the earrings. . I want to make 6 pr. Love them, now to order the supplies. I realize it’s late in the season, but hopefully there’s next year. thanks for sharing! !